SEASON 6: FIESTA AT RICKS! Yucatan is the home of habanero—arguably the hottest chile in the world—and the subject of chiles is the focus of one episode. But Rick catches everyone off guard when he points out that the food of the Yucatan is not hot (the dishes are cooked with mild chiles or a only very small amount of habanero). Interspersed in every show are scenes of Rick making the dishes that he found in the Yucatan or that were inspired by a special ingredient (one show focuses on the spice pastes that are the base of the seasoning of the cuisine). These scenes are shot in Rick’s home kitchen and garden in Chicago. 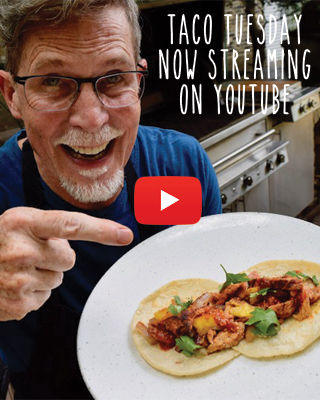 Rick’s clear explanations and the availability of recipes for all the dishes make it easy for viewers to make these dishes at home and experience the flavors of the Yucatan that Rick rhapsodizes about. One of Rick’s favorite shows is the one where he builds a pit in his yard, along with the help of his 15-year old daughter Lanie, to prepare cochinita pibil, the Yucatan’s most famous dish. After being inspired by seeing a cochinita pibil unearthed at a friend’s house near Merida, Rick and Lanie return home, dig a hole in the ground in the yard, line it with bricks, build a fire in it and cook an achiote-marinated pig in it. They invite friends over to witness the unearthing of the pig and then to enjoy it with them at a fabulous party. This show, among all 13 shows that make up the 5th season of the series, clearly exemplifies Rick’s passion for bringing the earthy, gutsy, delicious flavors of the Yucatan into the kitchens of fans of the show in the United States. What will the neighbors think when the people next door dig a pit in their backyard? Episode 2: A Man, A Pan, Paella! It’s a barefoot-on-the-beach dinner party cooked, served, and eaten outdoors. But the catch of the day is…there’s no beach! Instead, Rick and his family create a little Mexican seaside nirvana right in their Chicago backyard, complete with a cabana improvised from billowing white curtains, muslin draped overhead, white table linens, sparkling Mexican candles and orchids. And the food is as inviting as the mood, because it all comes from the grill, starting with Rick’s Grilled Garlic and Orange Guacamole, which gets its smoky flavor from flame-seared onions, garlic and jalapeños. Then come Grilled Mussels, cooked right on the grill grates, topped with tomatillo salsa and served as a passed appetizer. The main event is succulent Grill-Roasted Whole Fish Adobado marinated in sweet-spicy ancho chile adobo, grilled and served whole and sizzling, with a potatoes and onions, cooked in a “hobo-pack” right on the grill. Even the dessert gets the “beach-barbecue” treatment—it’s homemadeGrilled Cornmeal Pound Cake toasted on the still-warm grill and served with ice cream and fresh fruit salsa. Rick even provides a playlist of Latin favorites to match the mood. Conclusion: with a few good recipes and a little imagination, a Mexican seaside fiesta is just a barbecue and a boombox away. With a houseful of weekend guests, Rick and his daughter, Lanie, whip up an extra-special brunch buffet that turns Sunday morning into a mini Mexican vacation, inspired by the relaxed breakfasts they’ve enjoyed all over Mexico. Just for fun, they set up a hotel-style omelet station, complete with a propane burner, in the dining room—a great way for the host to join in the party—where Rick makes individual Chorizo and Chile Omelets to order as the guests sip orange juice. The buffet also includes Chilaquiles, a comforting casserole of crispy tortillas, softened in a rich, brothy chile sauce with shredded chicken and sour cream. And because it wouldn’t be brunch without coffee, Rick serves his press-pot version of Café de Olla, coffee sweetened with Mexican brown sugar and perfumed with spices and orange zest. It’s the perfect accompaniment for a Caramelized Mango Tart with Mexican Chocolate and Pepitas, an easy free-form fruit tart with a wrap-around pastry crust. Throughout the preparations and the party, Rick gives all kinds of helpful entertaining tips on everything from buffet-table tricks and making omelets for a crowd to cool Latin tunes to go with the menu. From street stalls to bustling taquerias and morning to midnight, tacos are Mexico’s favorite mini-meal—a few blissful bites of something thrillingly savory, wrapped in a soft, fragrant tortilla. And it turns out they’re also a perfect party food. Rick and his daughter, Lanie, plan a backyard taquisa—a taco buffet centered around one of the greatest taco fillings of all,Michoacan-Style Pork Carnitas, chunks of pork, slowly simmered in oil until they’re crisp and golden on the outside and succulent inside. Rick shows us how it’s done in Mexico in giant copper cauldrons, and then brings that idea home with the help of a surprising, cooking device—a turkey fryer. For pre-party nibbles, he shows how to turn salad-bar veggies into Mexican “Crudité” Platter, with the addition of a little store-boughtchicharrones (pork cracklings) and chamoy, a sweet-sour apricot hot sauce—flavors that go perfectly with his beer and hot sauce Micheladas. In the spirit of a true taquisa, Rick makes fresh corn tortillas on a hot griddle. To round out the buffet, there are black beans,Guacamoleflavored with sun-dried tomatoesand salsa, and everyone tucks into their tacos at little tables set up around the yard, taqueria-style. The meal ends with another street-food favorite, homemade Fruit “Mojito” Ice Pops made with fresh lime juice, mint and berries. To celebrate a friend’s birthday, Rick reinvents a tradition from his Oklahoma childhood: the ice cream social, where everyone brought a batch of homemade ice cream, right in the hand-churned freezer in which it was made. Inspired by the infinitely varied frozen treats and sweets of Mexico, Rick prepares three fresh takes of his own. First, there’s a Mexican Chocolate Chile Ice Cream, with a one-two punch of creamy-coolness and spicy heat. Then he makes Watermelon-Raspberry Raspado, Mexico’s version of shaved ice, with the refreshing addition of fresh mint from his herb garden, served over a splashy tropical fruit salsa. And just for fun, he throws in a third concoction, Ate con Queso Ice Cream, a tribute to the flavors of fruit and cheese that’s as easy as stirring Mexican quince paste into store-bought vanilla ice cream. He even makes his own homemade Ice Cream Cones.And along the way, he provides a party playlist of some of his favorite Latin music discoveries, as well as tips on setting up the buffet and keeping everything well-chilled. It’s a birthday ice cream social a la Mexicana. And that makes for one cool party. Who says cocktail parties have to be dressy, mood-lit affairs? Rick’s decided to reinvent cocktails with friends as an informal outdoor party. His menu, on this summer Sunday afternoon, is all about seafood and ice cold drinks. And his themes are simplicity, fun and freshness, inspired by Mexican deep-sea fishing trips where your catch transformed into the ultimate ceviche right on the beach. Rick brings that feeling home with a Mexican raw-bar menu that includes a Roasted Tomato Shrimp Cocktail, and two ceviches: a simpleTropical Beach Ceviche made with scallops,and a Yucatecan-inspired Salt-and-PepperCeviche. And since no raw bar would be complete without oysters, he shows viewers how to buy, shuck and serve Fresh Raw Oysters, complete with his favorite hot sauces. Musing that beer and mojitos would be the perfect drinks to go with this beach-casual menu, he combines the two in an inspired bit of mixology he calls Tecate Mojitos. Along the way, his creative serving tips—like using votive holders as individual serving cups or making dramatic ice molds that look cool and keep the food well chilled—and do-ahead shopping, chopping and prep strategies make this fresh take on the cocktail party as easy as a walk on the beach. Tamales are Rick’s idea of the perfect party food: little gift-wrapped packages of light fluffymasa dough with a whole fiesta’s-worth of sweet and savory flavors inside. And in Mexico, when family and friends get together for a tamalada—a tamal-making party, the cooking’s as much a part of the celebration as the eating. After a look at how tamales are hand-made in a traditional shop in Puerto Vallarta, Rick shows viewers how to pull off a tamalada for a crowd, where the guests roll up their sleeves and take part in the filling, the wrapping and, best of all, the feasting. There are Fresh Sweet Corn Tamalesmade with sweet corn and butter,and two kinds of classic Savory Tamales filled with red chile pork and green chile chicken. As these bundles steam and fill the house with fantastic aromas, the guests enjoyApple-Tamarind Cooler or, with the addition of some beer, a Mexican Snakebite, and Rick serves up bowlfuls of Caldo de Camaron, a spicy made-ahead shrimp soup with potatoes and dried pasilla chiles. This tamalada’s as much about cooking together as it is about eating together. And that’s one great packaged deal. It’s a hot, Midwestern summer day. The mood is slow and easy, and the garden’s in overdrive. So Rick decides to beat the heat and get out of the kitchen with a mostly made-ahead backyard cookout a la Mexicana, inspired by one of his world-favorite meat eateries: El Canelo, near Guadalajara. It’s a sprawling outdoor restaurant with dirt floors and strolling Mariachis, where slabs of succulent pork, lamb, goat and beef roast slowly on spikes in a walk-in wood-fired pit. And it’s wood, not charcoal, that gives the meat its unforgettable smoky flavor, so Rick gives us a quick lesson in setting up a home grill for wood-fired cooking. The menu is as casual as it is mouthwatering. For starters, there’s a Heirloom Tomato “Carpaccio” with tomatillo, avocado and fresh herbs—a salad made with tomatoes grown in “Earth Boxes” (part of a groundbreaking educational program that teaches sustainable practices to kids all over the world). And then, there’s the cookout: sizzlingCarne Asada Brava—ribeye steak marinated with serrano chiles and lime juice, seared over wood embers, sliced and served with homemade Salsa Huevona, fresh tortillas and beans. For dessert, Rick combines two of summertime’s greatest treats—ice cream and corn—to make a Sweet Corn Ice Cream with berry salsa, inspired by some of his favorite ice cream shops in Mexico. And since this fiesta’s all about simplicity, he shows how easy it is to set the mood with music, offering a playlist of some of his favorite Latin “finds.” It’s an irresistible take on summertime entertaining: shorts and T-shirts, robust flavors, and plenty of relaxed fun—for the guests and the host. The Baylesses love to feed a crowd. And one of their favorite ways to do it is firing up the Mexican-style barbecue pit they built in their Chicago backyard, inspired in part by the 3,000 seat Arroyo restaurant in Mexico City, where the pit-cooked lamb and pork make every meal a carnivore’s carnival ride. At Arroyo, we catch a glimpse of barbacoa—lamb wrapped in maguey leaves, slowly roasted in a massive brick pit. And with that mouthwatering memory in mind, Rick and his daughter, Lanie, prepare a block party for 25, featuring Oaxacan-style Barbacoa—lamb marinated with red chiles, wrapped in avocado and banana leaves and slow-roasted in the smoldering pit. To welcome the lucky friends and neighbors, there are refreshingly simple Watermelon Coolersand freshly madeTlayudas Oaxaqueñas, Oaxacan-style grilled tostadas, topped with chorizo, guacamole and fresh cheese. Then there’s the moment of truth, as the pit is opened, the leaves are peeled back, and the guests applaud the unveiling of the fragrant, juicy meat. It’s served up buffet-style along with black beans, salad and warm tortillas. And for dessert, there’s Lanie’s easy Mexican Fresh Lime Ice—and a band of strolling mariachis to make the celebration even sweeter. Rick’s having people over for a relaxed evening of parlor games. He doesn’t want to spend all day cooking. But still, he wants it to be special. So he’s set himself a challenge: in one hour, with one bag of groceries, he’ll pull off a big-flavored spread of Mexican party food. The secret is starting with great prepared ingredients and combining them to make something exciting and new. That means finger-food like little Tuna in Jalapeño Escabechefilled with good-quality canned tuna, quickly warmed with vinegar, onions and pickled jalapeños. It means using canned chipotles to transform ordinary nuts into spicy-smoky Chipotle Roasted Nuts, and doctoring tortilla chips with lime juice and seasonings, and then baking them to make Garlicky Black Pepper Tortilla Chips. And it means an ultra-easy Wild Mushroom Queso Fundido, a hot cheese dip made extra-flavorful with a splash of beer. From a few avocados and a handful of grocery store ingredients, Rick whips up a sweet-spicy Mango Guacamoleand a nuttyPumpkinseed Guacamole. And for drinks, he shares his restaurant’s classic recipe for Topolo Margaritas with fresh lime and blanco tequila. It’s a race to the finish—a one-bag fiesta that’s fun, flavorful, and best of all, fast. Rick’s on a mission to tell the world about tequila, and he’s starting with a party for 25 at home. But it’s not about doing shots and licking salt off your hand. He wants to open people’s minds and palates to the complexities of Mexico’s smooth, super-premium tequilas made from 100% blue agave—artisanal products on a par with the world’s great brandies. So he’s planned a tasting with tequila flights and plenty of fun, satisfying food to match. In the town of Tequila, Rick gives us a firsthand look at the production process, from the harvesting and roasting of the agave hearts to fermentation, distilling, and aging. Back in Chicago, he and his daughter, Lanie, get started on what’s often called the Mexican party food: a big, bubbling vat of Classic White Pozole, a hearty stew of corn and pork that goes perfectly with the flavor of Tequila. As the Pozole simmers away, Rick and Lanie prepare the rest of the menu: a Help-Yourself Tostada bar with three toppings to welcome the guests, and luscious Chocolate Pecan Pie Bars for dessert. Rick treats his guests to a lively and informative introduction to the essentials of great tequilas. Then everyone gets served a steaming mug of Pozole, topped with all the traditional trimmings, from pork cracklings to homegrown oregano. Put two of Mexico’s greatest hits—Tequila and Pozole—together, and you’ve got a fiesta that really takes flight. Episode 13: Street Fare Tonight! After giving viewers a quick on-location crash course in Mexican street food, Rick gets an idea. Why not create a one-night-only Mexican street-food stall right in his Chicago home kitchen as the centerpiece of an unforgettable cocktail party? And with that, he shows how to pull off three authentic Mexican street snacks. There are Molotes Poblanos—miniature blue corn masa turnovers with a choice of fillings: mushroom, potato-chorizo, and roasted poblano chiles with cheese; mouthwatering Tacos de Bistec con Nopales with juicy griddled steak, strips of nopal cactus and a drizzle of spicy tomatillo-arbol salsa; andHuaraches—griddled masa flatbreads, topped like pizzas with chorizo and tomatillo salsa. Rick mixes up some Agua de Jamaica—a bright red hibiscus-flower elixir that’s refreshing on its own and a perfect base for Mexican Cosmopolitans—and sets out some cut-up veggies, sprinkled with lime and chile, street vendor–style. And then, he transforms the stove and countertop into a street stall, complete with lights and decorations. The guests mingle in the kitchen (which, after all, is everyone’s favorite place to hang out), as Rick finishes the food on the griddle. And the irresistible combination of that made-to-order immediacy and great cocktails makes for a fiesta with some serious Mexican street cred.